If you are looking to buy an ice cream maker for the first time, you will be overwhelmed by the choice now available. Years ago of course it was not the case but today, as with so many other things, it is a very different scenario. First of all, there is the choice between a manual machine and an electric ice cream maker. 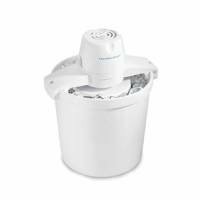 The latter, whilst much more expensive, bigger and heavier, actually freezes the ice cream as it churns it so you can go from your ready mixture to edible, servable fresh ice cream within as little as 20 minutes. Secondly, even with an electric ice cream maker, there are different types and styles to choose from. Gaggia for example have developed their own very distinctive style of machine which you recognise instantly the moment you see one of their ice cream makers and Cuisinart have also developed their own style such as the very popular ICE-50BC Supreme Ice Cream Maker (see photo left). Hamilton Beach makes an ice cream maker that looks entirely different again! Indeed, their Hamilton Beach 68330R 4-Quart Automatic Ice-Cream Maker (photo right) actually works in a different way. It requires you to pour your mixture into the canister, insert the dasher into the canister, attach the easy-lock lid and then place the motor over the canister, locking it onto the bucket. Then you add layers of ice and salt to the bucket covering the canister. Your homemade ice cream will then be ready in 20-40 minutes. 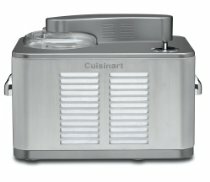 This particular ice cream maker can also be used for making frozen yogurt and custard. At under $40 it makes a great, affordable gift for a loved one or friend - especially if you know they love ice cream! So you see ... choosing an ice cream maker is not that easy any more.